As you may have noticed by the crude faces and rough curves, The Simpsons were originally created for television using traditional hand painted cel animation. Hundreds of talented artists worked endless hours to make our favorite family come to life through an ink-and-paint method on clear acetate cels which where placed under a camera and filmed. 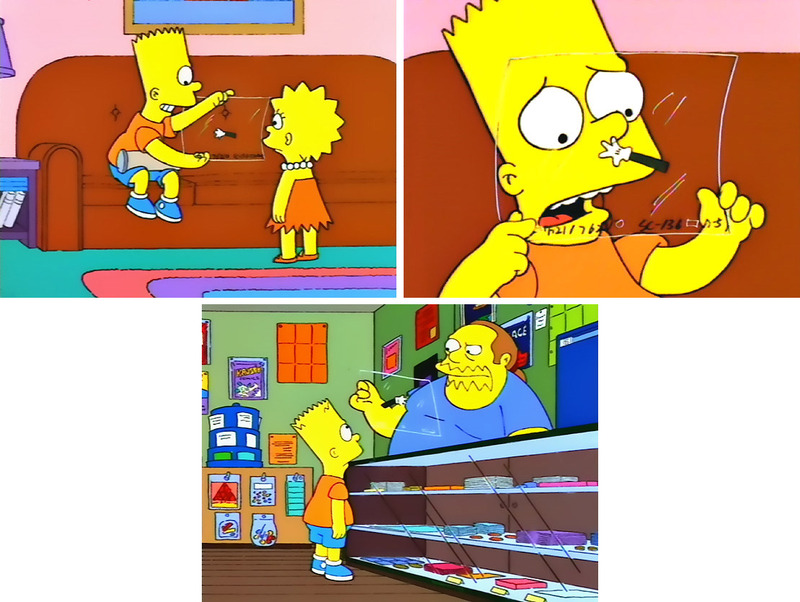 Cel animation was used in the production of The Simpsons during seasons 1 - 13 (1989 - 2002). Since season 14 (2003), the show has embraced advancements in technology and now uses a more cost effective digital system which eliminates the need for cels and the hand painting process altogether. Own a Piece of Simpsons History! Did you know that 20th Century Fox releases original production cels from The Simpsons for sale through authorized galleries? Fans now have the opportunity to own a piece of history from television's longest running animated sitcom. The holy grail of Simpsons merchandise has always been owning a cel which was filmed under camera and used in the creation of the show. These original production Simpsons cels are becoming increasingly difficult to find each year and are highly celebrated items that continually increase in value. View links to galleries that sell Simpsons cels. Once you obtain your first original production Simpsons cel or if you already own one, we would love for you to share your cels to the world through our website! We have created The Simpsons Cels Database where collectors can submit their original production cels and keep track of who owns pieces from each episode. Sign up and create an account today! The "Golden Age" of animation started in the early 1930's and gained immediate acclaim and acceptance. Animation cels and production artwork used in the creation of entertainment programs during this period have become highly sought after works of art. Animation artwork captures a period of art history that is now considered fine art and can be seen hanging in today's galleries around the world. Cel animation is a happy art form. It makes people feel good. The remarkable craftsmanship that made these animated programs so joyous, lively, and endearing to millions of people around the globe has created interest among people from virtually every walk of life. With each year, many new collectors and enthusiasts enter the market in search of a piece of history. As demand continues to increase and supply of vintage pieces lessens, we see an exciting future for the animated collector.